This Exhibition could only have taken place with the help of so many Stokesley people who have provided information, photographs, and other documents, so a very hearty Thank You to all the contributors. Of course the corollary of this is that we are always interested in old documents and photographs, particularly from people who can provide supplementary information relating to the documents or photographs. Please contact the Secretary on 01642 711875. 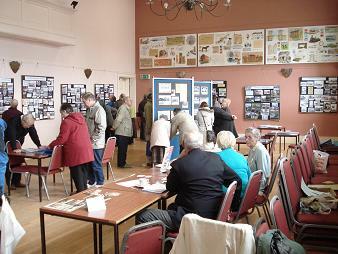 The 2010 Exhibition took place in Stokesley Town Hall, on Friday 5th March and Saturday 6th March 2010, from 10.00am to 03.30pm. 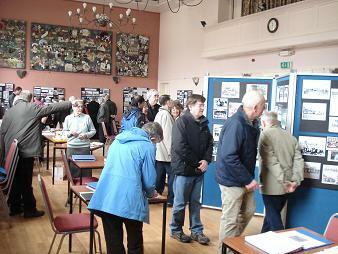 The Exhibition was entitled "Stokesley in the 20th Century". The Exhibition was extremely well attended (more than 500 people attended over the 2 days), and, as is always the case, the photographs evinced many memories from people - people recognised themselves, or their friends or family. The themes of the Exhibition were various. 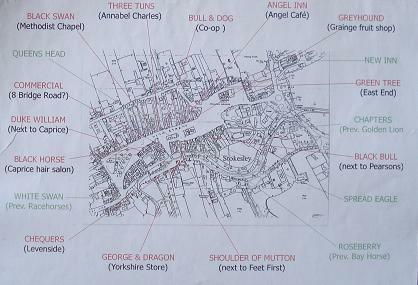 Included were "Homes and their owners", "Pubs and Brewers", "Stokesley Show and Fair", "Stokesley through the War Years", "Shops", "Churches", "Railway Stations", "The Yards of Stokesley", and many others. As with the previous Exhibitions, much of the information is stored in Stokesley Library, in the Local History section. 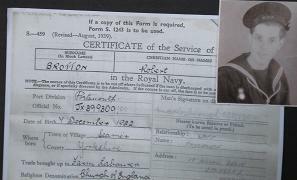 This is a certificate of Robert Brotton's service with the Royal Navy, provided by Robert's son, Bruce, who still lives in Stokesley. Other papers provided by the family gave an insight into the dangers faced by such men. In fact Robert had lost a brother in the conflict. Robert himself returned from the war, and lived until 1999. There was information on John West, who ran the chemist shop in Stokesley (currently Boots). John was a photographer while in the army, and he was one of the first to take photographs of the Normandy beach landings (which were subsequently featured in the film "Saving Private Ryan"). John's main task on D-Day, however, was to be first on the beach (in his case between St Berniere and Ouistreham) in order to clear the beach of mines, anti-tank devices, and barbed wire entanglements. On D-Day, 6 June 1944, John reckoned that 4 of the 10 men he was with died. That same day, he penned this poem. And all that it means to me. With thoughts that are dear to me. Where my heart so often sang. Dear country - second to none! The becks flowing gently on. Loved Cleveland! There's no place the same! Dear Home - we're fighting for you. Sweet home, I'll come back to you. Safe surety - come to our shore! We treasure; come stay evermore! At the end of the war John was the first photographer to attend the liberation of Belsen concentration camp, and he took many graphic images which will last forever.